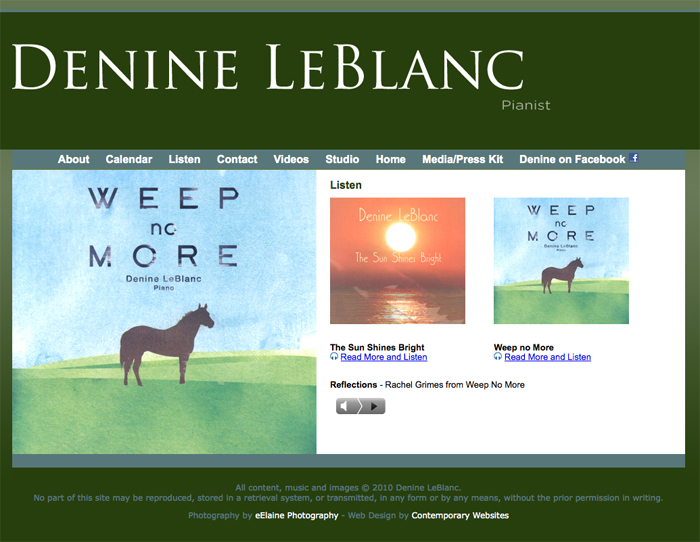 Pianist/composer Denine LeBlanc is known for her independent compositions the world over. Starting her work tour in 2011 she needed an easy to navigate easy to understand web presence which could be easily translated and that would present herself and her music in a profession and creative sensibility. We designed her site with her music in mind, included a calendar of performances and embedded MP3 versions securely on her pages so that people could read and listen along. The site includes Java Script features, social networking capabilities and a minimalist, clean design esthetic just as Denine preferred!